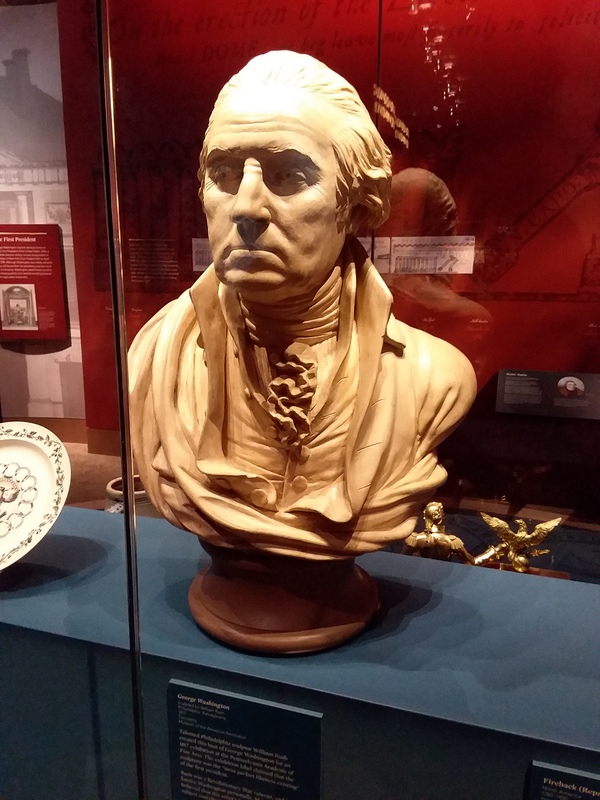 Bust of George Washington on display at the Museum of the Revolution in Philadelphia, said to be the closest resemblance in existence of the nation’s first president. The father of our country has been getting a bit of bad press lately. There’s been chatter going around that he’s no different from General Robert E. Lee, saying they both were Southerners, they both owned slaves, they both revolted against an oppressive government. The chatter says if you’re tearing down monuments of Gen. Lee, you should also be pulling down monuments of Washington, as what’s the difference? They were both flawed men, both incited dissent and revolution, both, I don’t know–rode horses (thanks, Brian Williams). And if we want to be perfectly truthful, both were men of their times. But there’s a distinct difference that some don’t get. Or rather, refuse to acknowledge. What Washington did, along with Jefferson and Franklin and Adams to name a few, was extraordinary in its audaciousness. They dared to propose a government not of kings but of laws, not of a hereditary monarchy but of the people. Of course it was exclusionary, but it allowed for evolution, to create a more perfect union, to strive for …the pursuit of happiness. This American Revolution began even before Jefferson’s pen scratched out its principles, because it was so revolutionary in its thinking it instantly made obsolete every form of government before it. These men were not only of their time, but of the future. They envisioned a way forward, they dared to think that all men were created equal, even if all men at that time weren’t. But toward that more perfect union they marched, this government of laws that no man was above, in a sincere effort to get it right. But Gen. Lee disagreed and led a march toward the past. He was defeated, as all backward thinking usually is. And in that, we find another truth. We won’t go there again. We can’t. Because it’s not only in our nature to not go back, it’s in our collective DNA. We’re still marching toward that more Perfect Union.